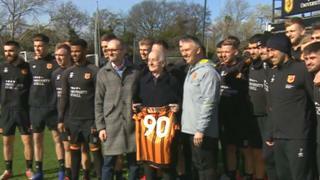 A Hull City fan celebrated his 90th birthday with a surprise tour of the club's training ground. Albert Cavill met the players and manager Neil Adkins and was given a signed shirt with the number 90 on the back. Mr Cavill has been following the Tigers since 1936 and has attended matches at all three grounds used by the club since they were founded. He described the surprise, organised by his son, as "absolutely brilliant". "I'm very emotional," said Mr Cavill. "I can't believe it really. I've never had treatment like this in all the years I've been coming here." Mr Cavill's house overlooks the training ground and he often watches the players preparing for games with binoculars from his bedroom. He recalled watching the club's first ever game at the Boothferry Park stadium while serving in the army in 1946. He also attended the first match at the current KCOM Stadium which opened in 2002. Mr Cavill does not go to many home games now, but will be a guest at the Tigers' home fixture against QPR on Saturday.